Accelerate workflow with high-speed file transfer. Quickly transfer files from both CF and SD card formats. While the high-speed Professional USB 3.0 Dual-Slot Reader supports the latest high-speed CF and SD formats, it’s also backwards compatible with standard CF and SD cards, as well as USB 2.0. This provides you with convenient versatility on the go. Save time with concurrent and card-to-card file transfers. 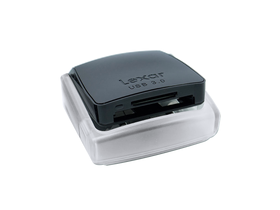 The Lexar Professional USB 3.0 Dual-Slot Reader has the ability to read from both card slots simultaneously, and it also allows for easy file transfer from one card to another—further enhancing the reader’s versatility. Enjoy the convenience of innovative design features. The reader boasts an innovative, pop-up mechanism that protects the card slots by allowing you to close the reader when not in use. Also, its compact, portable design means you can take it on the go, and smooth contours help it slip easily in and out of your camera bag. The reader’s sleek, glossy finish makes it a great addition to your workspace, and its LED activity light lets you know when your file transfer is complete. Includes a SuperSpeed USB 3.0 cable.